Yesterday morning I just happened to see on Facebook that the public library was sponsoring An Evening with A.S. King that same night! And at Taborspace, a really nice comfy space attached to a church, in my part of town. Eeeeeee! Her breakout book was Please Ignore Vera Dietz, which hit my Lifetime Best list as soon as I read it a few years ago. I don’t love all her books equally, but each one is different from the others and I admire that. And her kind of weird often does it for me. So. I caught the late bus home from work by the skin of my teeth, had a few minutes to dine on crackers and chocolate milk, and drove over there. 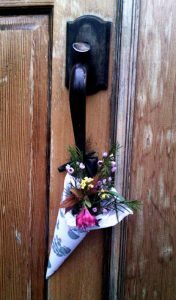 There were May baskets hung on all the doors, and still plenty of seating. In fact, when someone who wasn’t there for the reading cleared out, I slid into a comfy armchair about ten feet from the lectern! 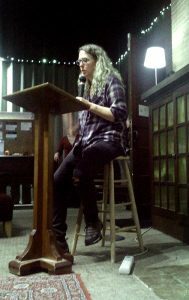 Sara Ryan, the YA author who also runs YA for the library, did introductions. Laini Taylor was there too. And a mix of teenagers– mostly girls but some boys too– and gray-haired ladies with glasses like me. It turns out the first draft of Please Ignore Vera Dietz was written in 36 days. She is a total pantser, and is a little worried right now because her current novel is over 400 pages and not resolved. Someone asked how many drafts she goes through in revision, and she estimated a hundred to a hundred and fifty. She compared it to combing long hair–there’s no way you can yank through it all at once. You have to start at the bottom and work your way up little by little. She reminded me a little of Lynda Barry. Maybe a little more extroverted– it felt like she could sit and shoot the breeze for hours (and I would be totally up for it). And she read a bunch from Still Life wIth Tornado, which is on my TBR stack and I’m pretty excited now to read it. So glad I made it to this event! 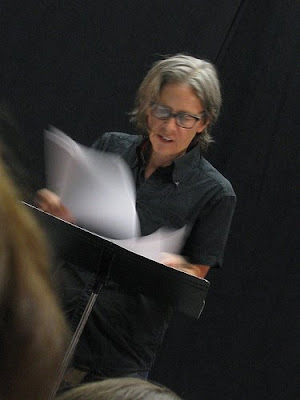 Yesterday I went to see Eileen Myles at Reed. One of the lines that’s always in her bio and was repeated in her introduction is that she moved to New York City in 1974 to become a poet. She did become one, and everyone is still curious about it. The students were trying to figure it out: what does that mean, what does she do exactly, how does she decide what to write down and what to make public. I’m going to read more of her work. Maybe even the novel with a main character named Eileen Myles, the sort of thing that usually makes me run screaming!